This article will deal with several points to look at and inspect on your guitar to keep it in top playing condition between your regular set-ups. Some tools may be required such as a large and small Philips head screwdriver, small flathead screwdriver, toothbrush, boiled linseed oil, small adjustable wrench, a small piece of #600 grit sandpaper, Naptha, compressed air can and electronic contact cleaner.The first thing we will look at is the overall condition and cleanliness of your guitar. I for one am all for preserving the funk and gunk of a well played vintage guitar up to the point where it starts to hinder the playability and fine adjustment of the instrument. 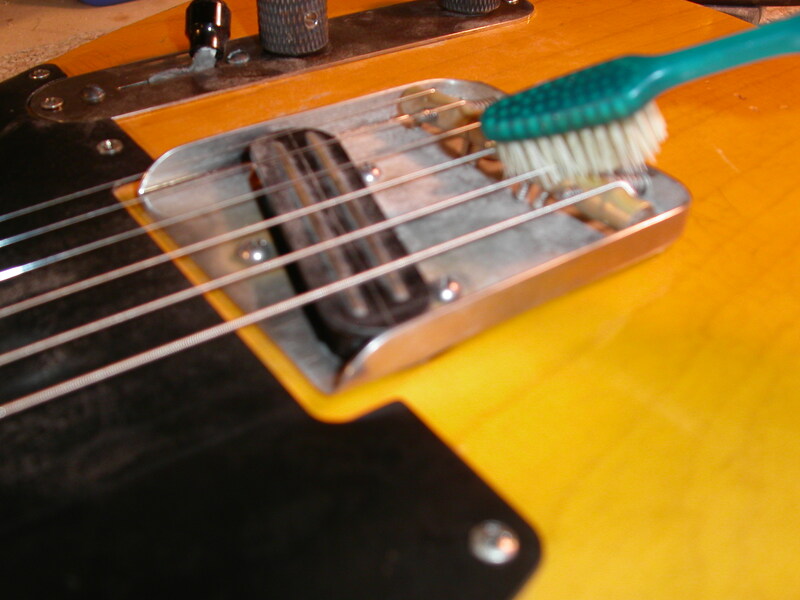 If your guitar has a buildup of gunk on the bridge saddles or any other metal part you can use a soft nylon bristle toothbrush to brush away some of this buildup. Be gentle with the brush in delicate areas. You can blow off any excess dust with a compressed air can. During a string change check the condition of the fingerboard. A finished maple neck can be cleaned with Naptha to remove any sweat buildup and then a guitar polish to bring back some of the sheen. A rosewood or ebony fingerboard can be cleaned the same way with Naptha and afterwards an application of boiled linseed oil to preserve the bare wood of the fingerboard. Acoustic guitars and archtop guitars with a floating wood bridge can get an application of the boiled linseed oil at this time as well as any other bare wood parts such as tuning peg buttons, tailpieces and knobs. Continued on page 2 – link below.